Complete 7 x 4 Bed & Cushions Pool Table cloth pack. AS USED IN IPA COMPETITIONS. 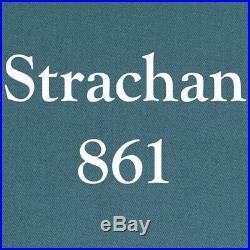 The Strachan 861 is a non-directional worsted (speed) cloth to assure constant speed in all directions. It has a smooth, precise surface which has been specially developed by Simonis in Belgium for the IPA professional tournaments. 861 is known for its durability and speed but also needs no ironing. The Strachan 861 Cloth gives you a flat, flawless playing surface. 861 SPEED BED & CUSHION CLOTH TO FIT ENGLISH 7x4 POOL TABLES. NB:- An English pool table is measured outside edge to outside edge of the wooden top surround. Fast Competition Championship Baize with fine finish. Size of cloth supplied is 78 inches long x 43 inches wide, plus 6 cushion strips. The item "861 POOL TABLE SPEED CLOTH IPA POWDER BLUE 7'x4' COMPETITION CHAMPIONSHIP CLOTH" is in sale since Monday, April 15, 2019. This item is in the category "Sporting Goods\Snooker & Pool\Table Covers". The seller is "allenronnie" and is located in Abertillery, S Wales. This item can be shipped worldwide.